Is the universe contracting, expanding or staying the same size? How to explain the red-shift and its significance? What is the 'Big Bang Theory of the Universe'? How old is the universe? What evidence is there for the Big Bang theory of the universe? Cosmology is a branch of astronomy that involves observing and studying the origin and evolution of the universe, from the Big Bang at the start, its current state and what is it's future? According to NASA, the definition of cosmology is "the scientific study of the large scale properties of the universe as a whole." At the moment the evidence suggests the Universe is getting bigger - some sort of expansion is taking place. Two models have been put forward to explain this expansion and the creation of the Universe itself. The Steady State theory states that the Universe has always existed in its current state and will remain so in the future. The model is based on the idea that the Universe looks roughly the same in which ever direction you look. In order for this to be so, the expansion is explained (but not proved) by new matter being created all the time ie more matter is created to cause the expansion. In the Steady State model of the Universe, there is no beginning and no end - an interesting philosophical concept! The Big Bang theory relies on the idea that all the matter of the Universe started out by occupying a very small space (referred to as a singularity). This tiny space or volume of material would be incredibly dense and hot. It then 'explodes' and expands to create space distributing the matter in it. This expansion is considered to be continuous - see evidence for this cosmological expansions in later sections of this page. Measurements of the rate of this expansion can give you an estimate of the finite age of the Universe - now calculated to be about 13.8 billion years (Our Sun is estimated to be 4.5 billion years old). Of the two theories, the Big Bang model more is the accepted one because it fits the ever increasing experimental data better than the Steady State model - the latter just does not fit in with several important observations. Some learning objectives for this page - not an easy topic! (a) Know and understand that if a wave source is moving relative to an observer there will be a change in the observed wavelength and frequency. (b) You should know that there is an observed increase in the wavelength of light from most distant galaxies. (c) Appreciate how the observed red-shift provides evidence that the universe is expanding and supports the ‘Big Bang’ theory (that the universe began from a very small initial point). (d) Know that cosmic microwave background radiation (CMBR) is a form of electromagnetic radiation filling the universe. (e) Appreciate that the ‘Big Bang’ theory is currently the only theory that can explain the existence of CMBR. 2. Why do we get light from stars? How do we analyse this light? 3. What is the red-shift? 4. How does the red-shift relate to our theoretical picture of the universe and its origins? Know that current evidence suggests that the universe is expanding and that matter and space expanded violently and rapidly from a very small initial ‘point’, ie the universe began with a ‘big bang’. The universe is big, but seems to be getting bigger and all the galaxies seem to be moving away from each other - so how are we going to explain this cosmological expansion? First, a bit of classical physics to help you understand this page on the red-shift and expanding universe. If a wave source is moving relative to an observer there will be a change in the observed wavelength and frequency. This is called the Doppler effect. To observe the Doppler effect, the wave source could be sound, light, microwave or any other part of the electromagnetic spectrum. When the source moves away from the observer, the observed wavelength increases and the frequency decreases because the waves get stretched out. When the source moves towards the observer, the observed wavelength decreases and the frequency increases because the waves become compressed. You experience the Doppler effect quite clearly when a loud racing car or train passes by you. As the loud moving object approaches you, the frequency (pitch) of the sound waves increases as oncoming sound waves are compressed (increasingly shorter wavelength). As the object moves away from you, the frequency (pitch) decreases as the waves stretch out (wavelength becoming increasingly longer). This is an effect, quite distinct from the fact that the sound of the moving object becomes louder then softer as the object passes you. (iii) if the object is moving away from us at great speed the light waves are stretched, wavelength increases, frequency decreases and the light shifts towards the red end of the spectrum (red-shift), so the object would look a little more reddish than it really is. The Doppler effect on light waves is used to measure the speed at which the galaxies seem to be moving away from us and our galaxy in all directions! This 'astronomical' Doppler effect (quite literally and metaphorically!) is one of the main pieces of evidence for the 'Big Bang' theory of the expansion of our universe from some 'point' at 'time zero' around 14 billion years ago! How do we gather evidence for an expanding universe? If the atoms of an element are heated to a very high temperature eg in a star they emit light of a specific set of frequencies (or wavelengths), called the emission spectrum of an element. These are all due to electronic changes in the atoms, the electrons are excited at high temperatures and then lose energy by emitting energy as photons of light. These emitted frequencies can be analysed with a diffraction grating or glass prism and recorded on a photographic plate or digital camera. This is an example of an instrumental chemical analysis called spectroscopy and is performed using an instrument called an optical spectrometer. Some schools may have a simple mini version of a spectrometer, called a spectroscope, for you to look through, to give you an idea of what spectrum looks like eg looking at flame colours by heating metals salts in a roaring bunsen flame. This type of optical spectroscopy producing emission spectra or absorption spectra has enabled scientists to discover new elements in the past and today identify elements in distant stars and galaxies. The alkali metals caesium (cesium) and rubidium were discovered by observation of their line spectrum and helium identified from spectral observation of our Sun (our nearest star!). Each emission line spectra is unique for each element and so offers a different pattern of lines i.e. a 'spectral fingerprint' by which to identify any element in the periodic table .e.g. 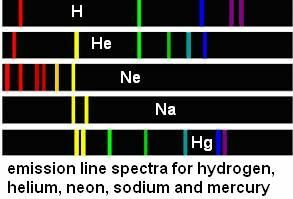 the diagram on the above right shows some of the visible emission line spectra for the elements hydrogen, helium, neon, sodium and mercury. As well as emission spectra you can also observe an absorption spectrum. As we have seen, stars are so hot that the atoms of the elements are in a gaseous state and due to electronic changes in these hot atoms, certain specific frequencies of visible light emitted BUT can be reabsorbed by atoms of the same element. This means certain frequencies will be 'missing' and not be observed at all as a coloured line. Therefore, when you examine the visible light from distant stars, you get black lines where that particular frequency has been absorbed by atoms ie that specific visible light frequency is missing. The resulting 'picture', obtained by using an instrument called a spectrometer, is called the absorption spectrum, based on the visible region of the electromagnetic spectrum. Its just like the emission spectrum line pattern because the frequencies involved are identical, BUT no colour! In the diagram, I've tried to illustrate the idea using the spectral lines of the element hydrogen. Hydrogen is the most abundant element in stars, but all the other elements absorb visible light waves, so the real absorption spectrum is much more complicated, but my diagram will do here to teach you the 'red shift' idea! In the hydrogen spectrum diagram above, the first two lines are red and green with lots of others in the blue-indigo-violet region of the visible spectrum. This is the pattern you observe when examining hydrogen gas on Earth in the laboratory or the hydrogen in the Sun. We will now combine the ideas from section 1. and 2. to explain the 'red-shift' and its significance of our understanding of universe - its origin and age. What is the red shift phenomena? The light from distant galaxies seems to be of lower frequency than expected. Hydrogen gives a series of specific spectral lines eg one in the red, one in the green, several in the blue and many in the indigo and violet region (which are not numbered in the diagram below). The vertical black lines in the diagram below represent the visible light frequencies absorbed. Now, if we bring in the idea of the Doppler effect, we can use this stellar (stars, galaxy, nebulae) absorption spectrum as evidence to show that the universe is expanding. So instead of racing cars or trains, think stars, if the galaxies are moving away from us, then the light waves will be stretched out over the millions/billions of miles so that the wavelengths get longer - which is in the red direction of the visible spectrum! When the spectra from galaxies from a variety of huge distances away from Earth, a pattern was noticed, first recognised by American astronomer Walter S. Adams in 1908. The pattern of spectrum of lines of elements like hydrogen seemed to be the same, BUT, the frequencies were smaller than what you observe on Earth or from the Sun. The shift to lower frequencies was called the red-shift because the 'shift' was towards the lower frequency red end of the visible spectrum. It is an example of the Doppler Shift described in section 1. The astronomer Edwin Hubble in 1929, further analysed the red shifts and related the increasing value of the shift to faster more distant galaxies. The red-shift to longer wavelengths and lower frequencies is indicated by the white arrows on the diagram below. I've only indicated the shift for the first two lines in the spectrum of hydrogen. 1. goes a deeper red and 2. goes from green to yellow-green to yellow. Notice that the 'pattern of lines', the hydrogen spectral 'fingerprint' remains the same. The indigo should a dark blue, but on saving the graphic image, a few curious effects happened, sorry about that, but it doesn't detract from the explanation of the 'red shift'! As you can see from the diagram, the more distant the galaxy, the bigger the redshift - the more the waves are stretched out with a longer wavelength and lower frequency. What Hubble and other astronomers found that the further a galaxy is from us (the observer) the faster the galaxy seems to moving away from as. These speeds are calculated from the red-shift. Cosmologists have therefore concluded that the whole of the universe is expanding. and all calculations indicate that the whole universe is expanding and the red-shift data is the most important evidence to support this theory! The observed red-shifts provides evidence that the universe is expanding and supports the ‘Big Bang’ theory (that the universe began from a very small initial point). It appears, that no matter which direction you look, the galaxies are moving away from us because all the absorption spectrums are 'red-shifted', and, what is more, the further away the galaxy, the bigger the red shift. A good analogy is blowing up a balloon with spots marked all over the surface. The spots move apart in ALL directions as the balloon expands. The spots represent galaxies spread throughout the Universe. This means that the galaxies are not only moving apart, but they are accelerating away from each other to the known visible-detected limits of the universe. Observations of supernovae over the past 20 years, suggest that the more distant the galaxy, the faster it seems to be moving away from us. This is the prime evidence for the an expanding universe from some common point 14 billion years ago, that galaxies all have a common origin, and that point's age is calculated by working back from the equations representing the expansion of the universe to the current rate of expansion! does not fit with evidence from observations of the cosmic background microwave radiation (see last section 5.). The theory is, that around 14 billion years ago there was some kind of enormous 'Big Bang' explosion resulting in the release of huge amounts of energy in some form from a very small space, and, that eventually, after 'cooling down' the 'particles' formed atoms, stars and galaxies etc. and all the resulting galaxies we see are flying apart from this point of origin. Its as if all the matter and energy of the Universe was compressed into some incredibly small volume of space (of extraordinary high density) and then 'something' triggered this great cosmological explosion. The result we see around us in the night sky! We have no idea about the origin of the 'Big Bang', all we can theorise is that our universe originated from this point (zero time!?). We also do not know how the current rate of expansion compares with that soon after the big bang. This means are calculations of the age of the Universe may not be correct. Incidentally, if the universe was contracting and galaxies were hurtling towards us, we would observe a blue shift of decreasing wavelengths in the emitted light from them, but no so such effect has ever been seen (as far as I know?). It might be that gravity acting between all the mass eventually slows the expansion, perhaps a contraction starts, nobody really knows! The alternative 'Steady State Theory' suggests that the Universe has always existed as it does now and isn't really changing because it looks the same in all directions. This theory says the red-shift is due to matter being created in the spaces as the Universe expands. However, the 'Big Bang' theory is the once accepted by most scientists today, but other theories will emerge as more scientific data is gathered about our Universe. Many scientists believe much of the Universe is made up of 'dark matter' an 'dark energy'. 'Dark matter' may hold the Universe together and 'dark energy' might be the cause of the apparently accelerating expansion of the Universe. BUT, we don't really know anything about the 'dark stuff', its just a theoretical idea without experimental 'detection' or proof', so we all have to wait on this one! Apparently dark matter doesn't emit electromagnetic radiation - so, unlike most material in the Universe, its a bit difficult to detect - very frustrating! and difficult to test the theory! The accepted value for the age of the universe based on current evidence is ~14 billion years. The Sun and Solar system, including planet Earth, is estimated to be about 4.5 billion years old. Although both the Steady State model and Big Bang model both explain the observed red-shifts and expansion of a universe from our observations that objects are moving away from us in all directions, the Steady State model cannot explain CMBR. Radio-astronomers have detected low frequency microwave radiation coming from all directions from all parts of our universe - known as cosmic background microwave radiation (CMBR). Microwave radiation is part of the electromagnetic spectrum, but the CMBR is of lower frequency than in your microwave cooker! It is believed that this radiation comes from radiation that was present shortly after the beginning of the universe, soon after the 'Big Bang' started. CMBR is associated with low temperatures as the young universe was cooling down and the background radiation reduces in frequencies. The ‘Big Bang’ theory is currently the only theory that can explain the existence of CMBR. If other evidence comes to light, the theory may have to be modified - 'watch this space'!